Since the introduction of the paleolithic diet about 20 years ago, paleo diet advocates and most LCHF experts have made evolution an important part of their evidence for their diet theories. In 2016 at the Low Carb Down Under Conference, a prestigious gathering of some of the top LCHF advocates in the world, one of the presentations was entitled Paleopathology and the Origins of the Paleo Diet. As I’ve listened to numerous lectures and podcasts and read articles from LCHF experts, this seems to be the prevailing attitude. It’s repeated continually by so many different experts that one would assume that evolution is a scientific fact. Oh, I hear the guffaws. You’re not serious, are you? Are you saying that evolution is not a scientific fact? Yes, that’s exactly what I’m saying. Evolution is not a scientific fact. It’s not even a good scientific theory. Wow, that’s not an opinion you hear every day in the health and wellness community, is it? But I’m prepared to back up my claim. Evolution is an emperor who has no clothes, and it’s time for us to admit it. Tyler Cartwright from Ketogains.com recently made some insightful comments regarding how good science works. Alluding to the research of Ancel Keys, Cartwright cautioned against blindly following nutrition gurus and warned that we should always be skeptical of the data. Remember that it was Keyes’ flaw data that was responsible for the USDA’s war on saturated fat and its subsequent recommendation of a high-carb low-fat diet. Today, many nutrition experts believe that it’s this diet that might be one of the main reasons for our country’s current obesity epidemic. Therefore, saying that I follow Atkins or that I follow Ornish or that I follow South Beach or any diet without examining the data behind the diet can be a recipe for disaster. We should never blindly follow scientific advice. See my post on statins here. We need to be completely transparent with data and the evidence. If we want to make the claim that a ketogenic diet is beneficial for X then we need to be prepared to support that both in terms of the “rah, rah” side of it… and also fund research to test and prove that hypothesis. And then to put it up to scrutiny by encouraging people with disagreeing dispositions … to then replicate the experiment…. And look to see if we’re seeing consistent results. Cartwright here expresses the foundations for a good scientific investigation. In order to accept a scientific hypothesis as true, it must have good empirical evidence and also be able to withstand criticism to the contrary. If the hypothesis is well supported, then it can be further developed as a good theory. This process of scientific investigation has been called the scientific method. It must be used to justify any scientific theory, including evolution. The basis for a good scientific investigation follows what scientists call the scientific method. This is the procedure. So, for example, let’s say that we observed that people who consumed copious amounts of refined carbohydrates over time develop high fasting blood sugar and then eventually type-2 diabetes. From this observation, we could theorize that prolonged excess carbohydrate consumption impairs insulin sensitivity which contributes to type-2 diabetes. To validate our theory, we could then design an experiment to test it. If we repeated our experiment keeping all variables equal, we could eventually come up with a good theory. Notice that all our observations took place in the present. This is extremely important when examining the theory of evolution. Let me show you why evolution can’t stand up to the scrutiny of the scientific method. Since evolution is something that has happened in the past, its processes are not observable in the present. We can’t go back into the past and observe non-organic matter turning into organic matter or a certain kind of ape ancestor evolving into two humans of opposite sexes. Since evolution is not observable in the present we can’t validate it with the scientific method. It’s not testable, repeatable, or falsifiable. Therefore, it’s not a scientific theory. Whatever evidence evolutionists gather from past events must be interpreted according to an a priori philosophical point of view. In other words, if an evolutionist were to hypothesize that man evolved from some prior species, they could only come to that hypothesis from a prior belief that man evolves. There’s no way to perform an experiment to show that this actually happened. But Don’t We Have The Fossils? Oh, but some will say we have the hominid bones that prove man evolved. No, we only have bones that suggest there was some other type of species living in the past. We have not seen a hominid turn into a man nor have we seen a living transitional species. We don’t have data from the present, only the past. In order to postulate that a certain species was an evolutionary forerunner to man, one must assume the theory of evolution. The scientific method urged by Tyler Cartwright to test scientific hypotheses can’t be used to prove the veracity of evolution. So what we have are evolution believing scientists putting forth their very best Janus face. On one hand, they appeal to empirical evidence for an LCHF diet while on the other hand appealing to evidence from a theory that is non-testable and falsifiable. Oh, but some would say that we do have good evidence for evolution. Again that evidence has to be evaluated with prior assumptions. With the introduction of the paleolithic (paleo) diet about 25 years ago, many scientists began appealing to the hunter-gatherer type diets of our supposed evolutionary ancestors as the optimum diet for contemporary humans. See here. Over millions of years, our primal ancestors evolved to eat basically a hunter-gatherer type of diet which included lean meats, fish, fruits, vegetables, nuts, and seeds and did not include cereals or dairy products. The introduction of agriculture and animal husbandry 10,000 years ago occurred too recently on an evolutionary timescale for the human genome to adjust. Therefore, the result of the mismatch between the contemporary human diet and our genetically determined physiology resulted in the emergence of many of the so-called diseases of civilization. See here. Since the paleo diet is low in carbohydrate consumption, most LCHF diet advocates have picked up on this evolutionary theory of nutrition and have made it an important piece of evidence for the diet’s success. It is, however, filled with assumptions that can’t be proven. The evolutionary argument for a paleo diet might seem cogent to you if you agree with a number of assumptions being made. But if you disagree with them, it’s not. In order to accept this argument as true, two of those time indicators have to be accepted as true. People evolved over millions of year and there must be an evolutionary timescale. This implies that the earth is millions if not billions of years old and that evolution is a scientific fact. Now, here’s the important question. Are those two beliefs proven facts or are they assumptions? Evolution has become so embedded in our culture that most people including scientists have accepted it as a fact. But is it? The earth is approximately 4.5 billion years old. Organic life formed from inorganic chemicals. Over the course of millions of years, simple life-forms developed into more complex life-forms and finally into humans. Different kinds of complex life-forms randomly developed through a process of natural selection and mutations. As I’ve already pointed out, because of the nature of these postulates, evolution cannot be verified by the same scientific method we would use to test whether excess carbohydrate consumption raises circulating insulin levels. But in order for any of the above postulates to be true, evolutionists have to assume one very fundamental fact. The earth is very, very, very old. That’s because, in the evolutionary schema, billions of years are necessary for higher life forms to evolve from inorganic matter. Now, we are always told that the earth is about 4.5 billion years old. And most of us take that as a fact, right? But how do we know this is true? Because evolutionary scientists have told us that it’s true. And how do they know it’s true? They say they have the radiometric dating evidence to prove. Now, should we believe them or should we examine the evidence? Let’s look at the evidence. By the way, it’s the only evidence presented to indicate an old earth. Evolutionists insist that they know the earth is around 4.5 billion years old based on a process called radiometric dating. Without burdening you with a lot of physics, these are the basics of radiometric dating. There exists in nature certain radioactive elements such as uranium-238, potassium-40, and strontium-87. The numbers next to the element indicate that the element is an isotope of the element meaning that it has an extra neutron. These elements are called parent isotopes. To achieve stability the parent isotope will usually discharge neutrons or protons. When this happens a new element is formed which is called the daughter isotope. For example, uranium-238 will decay into lead-206 and potassium-40 will decay into argon-40. The time it takes for 50% of a radioactive substance to decay is called the half-life. The half-life for uranium-238 is about 4.5 billion years. While potassium-40 has a half-life of 1.25 billion years. Therefore, if a rock contains 2 micrograms of potassium-40, after 1.25 billion years the rock will have only 1 microgram of potassium-40 and will have gained some argon-40. So, if an evolutionist happens to find a rock with 1 microgram of potassium-40 and a small amount of argon-40, they will conclude that the rock is 1.25 billion years old. This is how scientists theorize that the earth is billions of years old. It seems foolproof, doesn’t it? But it’s not because in order to work it must rely on some unprovable assumptions. When using this method, scientists have to assume that there was no daughter isotope originally present in their rock sample. In our example above, this would be argon. They make this assumption based on the fact that since argon is a gas, it should escape when the rock, usually lava, was formed. However, if there was argon present in the original sample, then the age of the rock could be highly exaggerated. We now know that argon can be trapped in large quantities of volcanic rock. In 1986, a sample of lava from the Mt. St. Helens crater was analyzed and found to have so much argon-40 that it had a calculated age of 350,000. However, the lava was actually observed to form and cool in 1986. To compensate for daughter elements present when rocks first formed, scientists have come up with a complicated mathematical formula called isochron dating. However, this method has also been known to give incorrect answers when applied to rocks of known age. Over the past 100 years, physicists have measured the decay rates of parent isotopes and have found them to be essentially constant. They have not, however, been able to determine if those decay rates have been constant for the past thousands or even millions of years. Scientists have just assumed that the rates have been constant. Recent evidence has shown, however, that decay rates have not been constant in the past. When geologists examined tiny crystals from a New Mexico granite source, they found that the uranium-lead age revealed that the crystals were 1.5 billion years old. However, they also found that only 6,000 years worth of helium had leaked out of the crystals. That means that uranium must have decayed very rapidly over the same 6,000 years that the helium was leaking. The rate of uranium decay must have been at least 250,000 times faster than today’s measured rate. There are several factors that could change the rates of decay, but I’ll leave that for another time. Since samples of rocks have not be taken from completely sealed locations, it’s quite possible that there may have been a gain or loss of parent and daughter isotopes by contamination from flowing water and molten rock beneath volcanoes. It is also possible that contamination could occur from volcanic molten lava that rose through channels deep inside the earth bringing with it rock from the channel walls. This process has been verified. Lava flows from Mt. Ngauruhoe, New Zealand that are known to be less than 50-years old have been found to yield a rubidium-strontium “age” of 133 million years, a samarium-neodymium “age” of 197 million years, and a uranium-lead “age” of 3.908 billion years. So, when discussing the subject of radioactive dating, the only thing that is certain is the amount of daughter element present and the present decay rate. We cannot know with certainty the past decay rate or the past amount of the parent and/or daughter isotope. Scientific data that gives inconsistent results and cannot be repeated is simply not useful for constructing a theory. 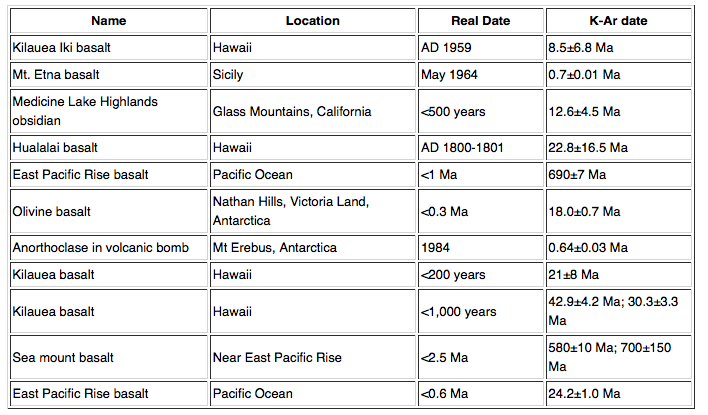 Below is a chart that shows known dates of rock formation and the dates given by potassium-argon dating. As you can see, radiometric dating is not a reliable method for dating the age of the earth. Also, as I noted above, different radiometric dating methods often give widely different ages for the same rocks. Using radiometric dating to suggest that the earth is billions of years old requires many assumptions and a great deal of faith. Most of us have heard about C-14 dating. It works on the same dating premise as the isotopes above and is limited by the same drawbacks. However, C-14 has a half-life of only 5736 years which is much shorter than the elements we examined above. This means that in 100,000 years there would be very little C-14 detectable in anything examined. In a million years, there would be no C-14 left anywhere on the earth. Yet geologists have found C-14 in coal that was supposed to have formed millions of years ago and in diamonds that were supposed to have formed billions of years ago. Explanations to these finding by evolutionary geologists have been less than satisfactory. In the last 13 years, numerous dinosaur fossils have been discovered that contain soft tissue remains such as collagen and blood cells. Paleontologists were astounded at this finding because they believed it was impossible for soft tissue to survive for over 64 million years. In order to overcome the implications of these findings paleontologists now theorize that the soft tissue was either trapped in the bone or preserved by iron oxide residue. Neither of these assumptions has been scientifically proven. What paleontologists refused to consider though is whether dinosaur fossils contain any C-14. Why would they? According to their presuppositions, there shouldn’t be any C-14 at all in a 64 million-year-old fossil. However, in 2015, scientists from the Creation Research Society gathered 16 samples from 14 fossil specimens of fish, wood, plants, and animals from throughout the geologic column and from a variety of locations throughout the world. After carefully preparing the fossils to prevent contamination, they were presented to five different commercial and academic laboratories for atomic mass spectrometry. CRS scientists found C-14 in all the samples, regardless if they were identified as coming from Cenozoic, Mesozoic, or Paleozoic source rocks. These results were consistent with carbon-14 dating that scientists had performed on other dinosaur fossils. See here. Paleontologists dismiss these results as flawed due to contamination of the samples. Oddly, that’s something they don’t admit possible with other dating methods. However, as I noted, CRS researchers were careful to avoid contamination. If these experiments are correct, then dinosaurs didn’t live millions of years ago but thousands. The effect of this would be to call into question the entire evolutionary schema proposed by their geologic column theory. Let’s remember what Tyler Cartwright had said previously. Evidence and data should be put to scrutiny by encouraging people with disagreeing dispositions … to then replicate the experiment…. And look to see if we’re seeing consistent results. However, evolutionary geologists refuse to engage in this carbon-14 controversy. They argue that since dinosaurs lived millions of years ago, it’s a waste of time to carbon date their fossils. My friends, that’s not science. If there’s evidence that falsifies your position, then deal with it. If you don’t, then you’re not doing science but are engaging in religion. If the earth is not billions of years old, then the evolutionary theory falls apart. There is simply not enough time for inorganic matter to eventually evolve into a male and female human. Not that it could in even an infinite amount of time. I want to note here that I have not argued for a young earth but simply that a very old earth is a highly dubious hypothesis. The evidence though seems to point to a young earth. The theory of evolution has become dogma in our institutions of learning for decades. From there, it has filtered out into media, popular culture, and even into our churches and has become ingrained in our culture. As the saying goes, if you repeat a lie, often enough it becomes the truth. But it is not the truth. And it’s time good scientists find the courage and step up and apply the scientific method to all scientific theories evidence, even if it means a demotion in their academic field. An appeal to atheistic evolution might not seem like a big deal. But remember, we’re more than just a body. We have souls as well. Failing to give glory to the Creator for His creation is dangerous business for our souls. An interesting article which I will re-read when I have more time. I recently heard a BBC Radio 4 programme about Tim Noakes and his LCHF diet and was doing some research into evolution and the human diet as I find it odd that dogs, which have only been domesticated for about 15,000 years, have become omnivores while humans, who have been around much longer, have not have evolved past a hunter-gatherer diet. John- I’m on the same body recomposition journey (SS, LCHF, etc.). Very much enjoying your posts! Hi, Mike thanks for commenting. Forgive me for taking so long to reply. Unfortunately, I got wrapped up in some other projects. It’s unfortunate what is happening in SA concerning Tim Noakes. His diet recommendations are actually helping many people regain their health. Interesting thoughts on canine and human diets, I think it’s possible that God created dogs to be omnivores and he created humans to thrive on a low carb, moderate protein, healthy fat diet. I also don’t think that creationists would deny that species can adapt to their environments.